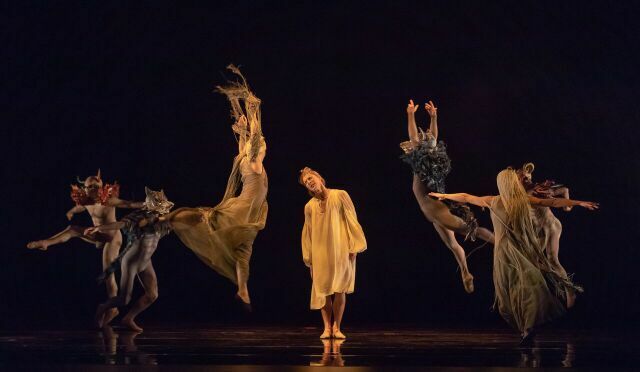 Birmingham Royal Ballet(BRB) has put together a double dose of contemporary creative works for its Autumn Season that includes a world premiere inspired by a famous Turner painting. Fire and Fury includes the premiere of Ignite, pictured. 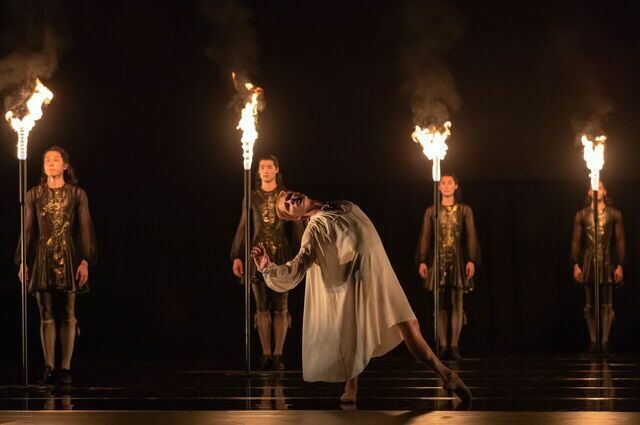 The premiere of Ignite by Juanjo Arques follows David Bintley's The King Dances in the Fire and Fury two-dance mixed programme, which I caught at Birmingham Hippodrome. The tour not only includes Birmingham but also Theatre Royal Plymouth on October 9 and 10 and Sadler's Wells in London on October 30 and 31. Audiences have to wait until after the interval for the highly anticipated new piece of work - Ignite. Inspired by Turner's painting of The Burning Of The Houses Of Lords And Commons, it's an abstract piece that uses movement exquisitely to create the feel and visual effect of flames licking the building. Choreographer Arques has created an eye-catching short dance production that reflects well the beauty and violence in the painting. 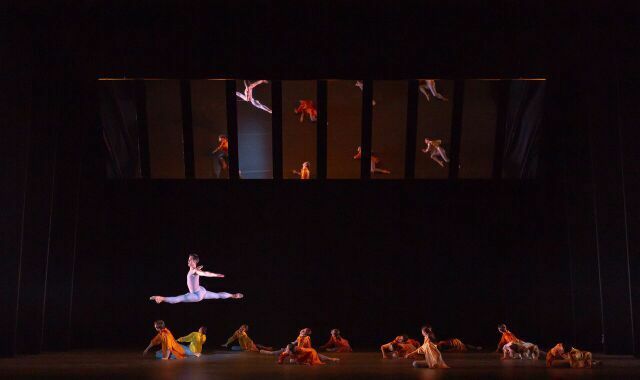 It opens animatedly with three dancers running towards a panel of mirrors, which line the back of the stage. The mirrors slowly rise up and angle themselves so that the audience gets a multi-dimensional view of the dancing throughout. This especially works well when groups of dancers in various shades of orange swarm the stage at regular intervals and reflect en-masse like billowing flames in a breeze. This co-production between BRB and Dutch National Opera and Ballet saw Arques working closely with dramaturg Fabienne Vegt to create a libretto in three movements to a new energetic soundtrack by Kate Whitley. It's atmospheric and hugely watchable. The creative team has attempted to translate the painting into dance and rather than a narrative story, it's the colours that are adapted into a different medium. The tepid oranges of the ensemble spread quickly but it's the scorching hot dancers in red ( a fine pairing of Celine Gittens and Brandon Lawrence) that are the real eye-catchers. As is Delia Mathews in pale blue as the river that gently quivers around the stage in gentle distress before watching on calmly to the proceedings and the flames eventually turn to ash before something new can arise. Dancer Celine Gittens has talked about the development of the 'red' role and said Arques wanted the red characters to be the ones that kept the fire burning - "The red couple is the fire burning so you have to be hot, fierce, and risky", which Arques is with his choreography. It's a well crafted, interesting new piece of work. The Fire and Fury mixed programme brings together two ballets that are fuelled by power and politics. This is particularly true of the other piece, The King Dances, which opens the programme. This David Bintley creation returns three years after its premiere at Birmingham Hippodrome and reflects well the undercurrent of menace that would have always been close by in the court of Louis XIV. It's a piece that pays homage to the beginnings of ballet in this glamorous, lavish French royal court, when a young King Louis XIV of France danced the role of the Sun God in a spectacular court show, which led to him being nicknamed 'The Sun King'. There's more of a storyline in The King Dances as Louis struggles for power against his mentor, Cardinal Mazarin against a jarring, menacing soundtrack by Stephen Montague. Max Maslen is a strong lead as Louis, performing with elegant fragility alongside Yijing Zhang as the dancing moon but then bringing out power and fear in his movements when faced with his nightmares and Mazurin ( an always reliably good Tyrone Singleton). The pace and drama surges in the third part of The King Dances when his majesty is confronted by nightmares of demons and werewolves tearing him apart and eventually back into the darkness. The choreography is vivid, rough and sharp in this outstanding section. Powerful and passionate, this part requires such agility from the lead but it is the highlight of the production and completely mesmerising. It's also a metaphor for the cut-throat nature of the court and the fear that would have surrounded Louis, who inherited the throne at five but always had the threat of assassins looming over him. Overflowing with imagery, mostly dark and menacing, this piece is a memorable and fascinating short production. It's also a worthy choice of David Bintley choreography to showcase as the BRB Director prepares to move on from the ballet company. The pair of dances make for an intriguing double bill that will particularly excite those interested in seeing more contemporary, fresh dance productions rather than older classics.